​Simpson, which was previously known as Brittsville, also Brittain and Simpsonville, originated in 1871 when G. Beaver, who at that time owned a mill at Delphos, came up the Solomon River to sight a spot for a mill. With financial aid from Thomas Shanks and Alfred Simpson, a mill was erected at the site where Brittsville started. By 1879 Brittsville was a thriving little village with a store, drug store, blacksmith shop, post office and stage stand. With the coming of railroads, between 1879 and 1880, Brittsville was moved a mile to the present townsite of Simpson. 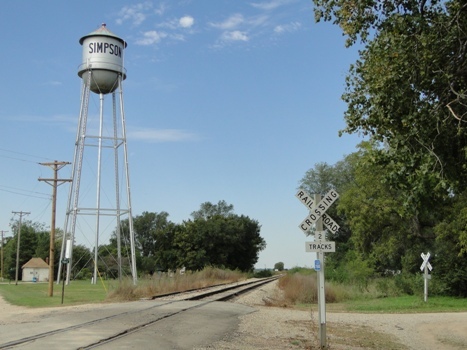 In 1882, after Alfred Simpson deeded a portion of land upon which the town was built to the city, the name was changed to Simpson, in his honor. The land on which the city was situated was first owned by T. E. Thackery, who on December 29, 1875, registered a receivers receipt for the property. Tom Shanks and Simpson started the first store in the new locality: and the first house belonged to George Leinen, Sr.
My name is Betty Jane Grittman. I was born in Simpson in 1936. In the comfort of the family home, Doc Schaffer helped my mother bring me into this world of dust, economic depression, and struggling farmers. Mom worked part time as a shop girl and part time as a telephone operator, and Dad helped a local farmer move the dust around in the fields. Doc Schaffer made house calls, ran a hospital out of his house, and later had a fine drug store built in downtown Simpson. Schaffer’s drug store had the most beautiful soda fountain! The drug store was situated on Mill Street. We are a practical people–the road leading to the Mill was named Mill Street. Just north of the drugstore was the Johnson Bros. grocery store. I thought I was one of the luckiest kids around because the grocery store boasted a roller skating rink on the second floor! My big sister Billie Jean and I would go roller-skating two times a week. Across the road east from the roller rink was Joe Jindra’s filling station and above that was, of all things, a ballroom. When Lawrence Welk was a young traveling musician, he and his orchestra performed in that ballroom! While I was growing up, Simpson supported three grocery stores, a restaurant, a locker plant, and a barbershop. They served the 300 people living in town and all the folks living in the surrounding area. Just across the road from the locker plant on Front Street, Uncle Elroy Horn operated the local blacksmith shop. When I was a little girl there weren’t too many horses still in use so the blacksmith kept busy fixing farm equipment, sharpening plow lathes, and fabricating anything you needed made out of metal. The Simpson Post Office was just south of Uncle Elroy’s blacksmith shop. It was housed in the building where Trapper’s Bar & Grill is now. Of course, it wasn't near as big as Trapper’s is now. The post office was made up of just the little front part of the existing building. After my Dad came back from WWII in the Pacific, he was appointed postmaster of Simpson. Sometime in the late 1970s Dad helped move the post office to the new building–right next to where the Tri-Century Bank is now. When I was a little girl, Simpson revolved around the area’s wheat farmers, cattle ranchers, and the railroad. Our grain elevators stood tall and proud next to the rails. Those rails were our pipeline to the world. There were still passenger cars on the train. We could go to Salina by train and from there go anywhere in the world. The Simpson depot still stands today. It looks pretty sad but no one has the heart to burn it down. It’s part of our heritage. Simpson had a fine school system for the children. We were the Simpson Coyotes! We were taught the basic three: reading, writing, and arithmetic. Penmanship was important then. All the boys took Ag Mechanics and all the girls took Home Economics. There was a class that taught civic responsibility. I don’t think the schools teach that any more. The school stayed open just long enough for my baby sister, Brenda, to graduate in 1968. One of our young teachers, Bob Severence, moved to Beloit and helped found the NCK Technical College. Now all the kids go to school in Beloit or Glasco. In 1953, I married Edwin Lynch, a boy from Beloit, and moved there. We raised three children but eventually, in 1975, found our way back to Simpson. By then the business community had shrunk considerably. There were no restaurants. The locker plant had closed. The drug store died with Doc Schaffer. Uncle Elroy was hurt while helping the county build the new bridge over the Solomon River south of town and had to close his blacksmith business. The beautiful school gymnasium was being used as a welding shop and the school playground equipment had turned into pathetic piles of twisted metal, broken boards, and rust. The elevators continued to operate; therefore the bank, the post office, the filling station, and a small grocery store were able to hold on, too. And there was still some community pride. We gathered up all the pride we could find and started the Pride Committee. There was grant money available through a state-level organization, so we put our heads together and filled out the grant paperwork. The money we received provided the materials we needed to restore the playground equipment and move it to Shanks Park on the west edge of town. My grandchildren, Regina and Patrick, grew up playing on the beautiful merry-go-round. The swings are still there. So are the teeter totters and the shelter house we built. It’s now part of their heritage. Edwin died in 1986. The big old house we’d fixed up together rattled around me. My sons, David and Mark, moved back home to help with the family business. Mark bought the business. David bought the house. I moved on. Mark eventually moved on too, but David and his wife decided to stay and raise their children in Simpson. The elevators and grocery stores are gone now. The old wooden elevator was burnt down in the early 1980s. Our grain finds its way to the world through the modern facilities in nearby Asherville, Beloit, and Concordia. The ground storage elevator on the east side of town has been resurrected as a sawmill and pallet factory. That is a good thing–commerce will keep Simpson alive. The post office and the Tri-Century Bank continue to serve the surrounding community. Jindra’s filling station now houses Bill Bergman’s high performance engine repair shop. Simpson’s current claim to fame is Trapper’s Bar & Grill. Tony Prochaska has expanded the building three times since it opened almost nine years ago. The most recent addition was constructed with limestone rock from his grandparents’ homestead. There’s pride. There’s heritage. The restaurant is regionally famous. People as far away as Salina come to eat there. Trapper’s is where we find out what’s going on in town. Trapper’s is where the DHL and UPS drivers leave their deliveries for local folks who aren’t home during the day. Trapper’s brings so many folks to town that it inspired my daughter-in-law to open a bed and breakfast guesthouse, The Cottage on the River, just south of town in Uncle Elroy’s old house. Trapper’s draws tourists. Tourism is commerce just like farming and saw mills. Commerce and pride will keep Simpson alive. My heritage will live on in my children, grandchildren, and the town of Simpson.